Here's another classic Japanese recipe from my mother. I have to admit that I'm not very good with fish, with the exception of simple grilling or panfrying and so on, but my mom has all kinds of great fish recipes up her sleeve. 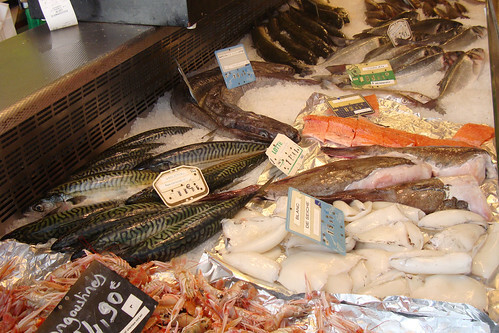 Last week we spent a rather chilly week in Brittany (Bretagne), where the highlight was definitely the abundance of cheap, really fresh fish available to us. One fish in particular that was really good and inexpensive was maquereau, or Atlantic mackerel, which we know as saba （鯖 さば）in Japanese. In Japan, mackerel is usually treated one of three ways: grilled over an open flame (amiyaki), treated with salt and vinegar (shimesaba) and turned into an old fashioned kind of sushi (sabazushi), or gently braised in a sauce with the classic Japanese combination of salty-sweet flavors. This mackerel is cooked in a ginger scented miso sauce, then allowed to cool down in the liquid overnight, which allows the flavors to penetrate the firm flesh of the fish. You barely notice the oiliness at all, and the sauce is plate-lickingly tasty. I like to eat it chilled, right out of the refrigerator, with plain rice and a simple salad on the side. It makes for a refreshing yet rich dish for a summer meal. Peel and finely julienne (cut into small matchsticks) the piece of fresh ginger. Add about 1/2 cup of water, sugar and the soy sauce, and stir until the sugar is dissolved. Add the julienned ginger and miso, and stir until the miso has dissolved. Add the fish pieces with the slashed side up, and then add more water until the liquid comes about halfway up the side of the fish. Bring up to a simmer, then lower the heat to about medium-low. Make a 'lid' with some crumbled up aluminum foil with a few holes poked in it, and put this 'lid' (an otoshibuta or dropped lid, see here for an explanation of otoshibuta) on top of the fish. Simmer on medium-low heat (the liquid should be bubbling gently, but not boiling) for about 15 minutes. For best results, lift off the foil lid a couple of times, tilt the pan to gather the juices in a corner, scoop the juices up and baste the fish with them. After 15 minutes, turn off the heat and replace the foil lid. Let cool to room temperature, then transfer to a bowl, cover and store in the refrigerator overnight. 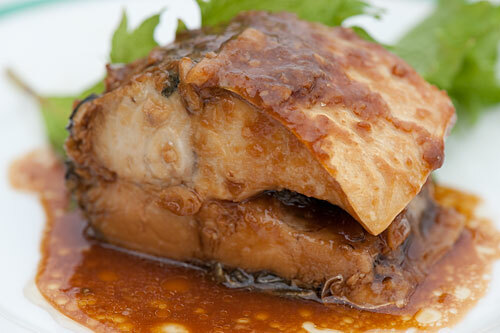 This allows the fish to firm up and also absorb the flavors of the braising liquid. Serve chilled or heated up a bit, with a little of the liquid spooned over, including some of the ginger bits. A little green for garnish is nice too - I used a fresh shiso leaf, but some parsley or even lettuce will do too. Note: While this has the strong flavors that go so well with rice, I don't recommend this for bentos (which is why it's on Just Hungry, not Just Bento!) since you do have to keep it chilled until right before eating. If you want it warm, just heat it up a bit in a pan with the liquids. Saba is an 'oily' fish, like herring, bluefish, smelt and sardines (or pilchards). It's packed with good-for-you omega-3 fatty acids and is considered to be sustainable and low in mercury levels too. The fish counter is also a good gauge of how fresh the fish is. It shouldn't smell fishy or rank; it should just smell like the sea. Here's the counter at the poissoniere we bought the mackerel we used from, in the small villege of Damgan on the southern coast of Brittany. My mother declared their fish to be as of good a quality as any she's seen in Japan. Coming from her, this is high praise, since she's über-picky about her fish! Submitted by maki on 2009-07-27 22:22. This is how my mom makes mackerel too. I think mackerel is my favorite fish, both raw and cooked, because of the oily fishiness. Yum! thank you for that very informative link on fish sustainability. As much as I love maguro and shake (and I knew, before reading the link, that maguro is a rather iffy thing to be consumed), I wasn't all that aware of the issues with unagi, for example. I think it's about time more awareness is raised on this issue so that people know - and will take action with regards to - what they're consuming. Incidentally, as a Japanese person, what is your stance on this, seeing as how fish has been enshrined in Japanese cuisine? I remember walking into a supermarket near my dorm one day to see a maguro head at the sashimi section; it was weirdly eerie and yet poignant at the same time. I will never be able to bring myself to consume whale, though; the few times I've seen it at the sashimi section, it looks like beef, but the image of eating such a creature is rather off-putting. And yet I eat maguro; the irony! And just because I forgot to add it in my previous comment: my favourite form of saba is shioyaki, mmm. Although when it comes to actually cooking it I'll probably end up steaming or pan-frying it. I had saba maki-zushi lately; while I liked the texture and taste, I think the takana the roll was wrapped in put me off. Maybe I should try it as a nigiri when I go for kaiten-zushi the next time. I wrote about this briefly in this post. Mainly it's a good idea to eat a _variety_. I write this as I recall one guy (an American) who used to come to my mom's sushi restaurant all the time (like 2-3x a week) and always order a plate of tuna/toro sashimi, followed by like 10 pieces of tuna/toro sushi. Multiply people like him by several million or however many people there are eating sushi regularly without any thought to variety, and there's a problem. Yes, I noticed if you eat sushi outside Japan, it's usually the popular 3- tuna, salmon and eels. And Jewish people don't eat shellfish and fish without scales like eels (for them they are not real fish), so when I took my former boss, who is Jewish, to a sushi place in Japan she only had tuna nigiri while the rest of us ate omakase. I get irritated when people blame the Japanese for the loss of bluefin tuna. I mean, our population is even declining and we've been eating sushi long before the rest of the world started eating! Hey Makichan....your mum is very special I think...my mother inlaw is very similar ....she went to cooking University apparrently and after raised 3 kids as a house mum and Haiku guru for the last forty years...shes the best cook I have ever seen...she lives in Omura(Nagasaki) but comes to see her grandaughter in Fukuoka every other week and cooks up a storm from nothing. I overdosed on saba miso with kyushoku back when I was with the gakko 's...its a healthy dish.! In Australia they use saba to fertilise their gardens and feed cats...such a waste! In Kansai and the west, (I'm from Yamaguchi) instead miso we braise saba in soy sauce because a long time ago only eastern Japan had fresh saba and the west had salted and miso does not go along with salt so it became a staple in western Japan to braise(instead of niru, it's taku like rice) in a sauce with soy sauce as the base. Thank you for sharing this recipe! It is absolutely delicious! I only tried it because a local market was advertising mackerel for only $1.99/lb (just slightly more expensive than chicken around here) and I had never tried the fish before so my research led me here. Tried it over the weekend (and even added it to my bento since it was going to a fridge quickly) and really enjoy it. Instead of the mirin (since no one around here seems to know what I'm talking about when I ask about it) and sake (too many options to know what to get! :/) I used some fish sauce with a little extra soy sauce and water. Also, I noted that if you flip the fish the cooking time can be cut much shorter as it cooked one one side within a couple minutes of putting it in the pan; but I let it marinate according to directions which I'm sure is what helped it absorb so much flavor! I'm glad you liked the recipe! I should mention though that fish sauce has an entirely different flavor from mirin or sake. Next time, try some sherry, or failing that, a little bit of sugar. Thanks for letting me know the substitutes, no one around here seems to know what mirin is (even the Korean run liquor store). :( Could I use a plum wine instead? Overall I don't seem to be a big fan of sake by itself & haven't tried cooking with it yet. I kind of figured the fish sauce would have a different flavor but wasn't quite sure what would be a good substitute so I winged it. lol Thanks again! I just tried this tonight - Wegman's had some fresh Mackerel, which they cleaned but didn't fillet, so I was looking for ways to cook a whole Mackerel. My slicing skills aren't good enough to fillet it myself or turn it into sushi. Also, it's winter so I didn't want to grill. The dish tasted sweet and savory and not too fishy or oily. It's texture was tender, and it smelled just like smells from a restaurant. I couldn't wait and ate half immediately. I did save half for tomorrow and I'm looking forward to seeing how the overnight marination increases the dish's flavor. Thanks for telling us all about such an easy and delicious recipe.